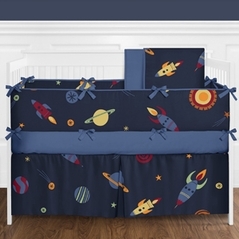 Welcome to our Moon and Star Baby Bedding section! Here you will find the celestial baby bedding sets that will evoke a sense of wonder and beauty in the hearts of your children. The azure blue beauty of our Moon and Stars baby crib bedding represents the clear sky blue of a clear summer day. 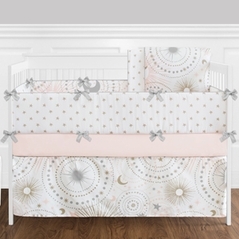 And just like our popular line of Contemporary Baby Bedding sets our Moon and Star Celestial Baby Bedding sets are constructed with the finest hypoallergenic fabrics and are constructed by leading bedding brands such as Sweet Jojo Designs. Imagine wrapping your beautiful baby in luxurious chenille and decorating his/her room using our perfectly coordinated accessories like our moon and star window valences and wall borders. 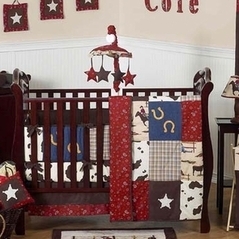 Use this theme to create a magnificent star nursery for your little shining baby boy or girl and also make sure you check out our striking Eyelet Crib Bedding sets and the Fairy tale nursery rhymes nursery bedding theme. And just imagine sitting with baby and reading Goodnight Moon - what could be more perfect? 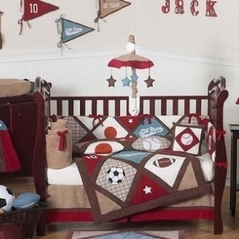 Whether you have a boy or girl, you simply cannot go wrong with baby bedding with stars. And if you are interested in nature-themed crib bedding sets then please check out our Ocean and Sea Crib Bedding Pages!